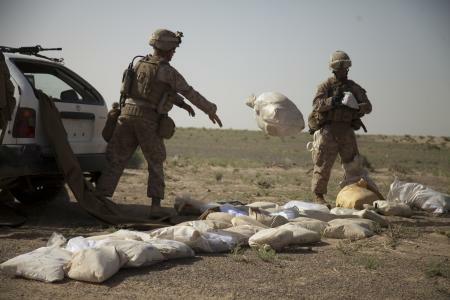 A new Pentagon report highlights a notable trend: Expanded military operations and counternarcotics raids in southern Afghanistan have helped to decrease the cultivation of drugs used to fund the insurgency there. The decrease was the most striking in areas where coalition forces have a strong presence, particularly in Helmand province, said the “Report on Progress Toward Security and Stability in Afghanistan.” Nearly 20,000 Marines are deployed there as part of a 30,000-troop coalition force commanded by Maj. Gen. John Toolan, head of II Marine Expeditionary Force (Forward) and Regional Command-Southwest. A version of the report is released every six months, outlining the changing face of the war. The latest one, dated October 2011, said the growth of opium-yielding poppy has declined in Helmand three years in a row. I wrote about the previous report here. The Pentagon attributed the drop in drug production in part to counternarcotics operations spearheaded by coalition troops, the U.S. Drug Enforcement Administration and the National Interdiction Unit, a U.S.-funded counter-narcotics law enforcement unit that includes Afghan personnel. It falls under the Afghan National Police’s counternarcotics forces. Together, the organizations plan and conduct raids, especially in Helmand and Kandahar provinces, where the cultivation of poppy is common. Three major raids were conducted in Helmand this fall, resulting in the destruction of several major drug-producing hubs, the report said. In the first, DEA, NIU and coalition forces destroyed a laboratory in an unidentified area of Helmand on Sept. 17, seizing 6,120.4 pounds of morphine base, 4,293.8 gallons of morphine solution, 8.8 pounds of heroin, 2,299 pounds of sodium carbonate, 2,699.4 pounds of ammonium chloride and drug processing equipment. The NIU arrested nine people. The second operation in Helmand occurred Sept. 26. Three more laboratories were destroyed, and coalition forces seized 13,057 pounds of morphine base, 2,855.7 gallons of morphine solution, 220 pounds of heroin, 7,216 pounds of sodium carbonate, 25 gallons of acetic anhydride, 6,270 pounds of ammonium chloride and processing equipment. The seizure was one of the largest ever made by combined forces in Afghanistan, the Pentagon report said. The third Helmand operation occurred Sept. 28. DEA, NIU and ISAF forces reportedly seized 1,424.2 gallons of morphine solution, 6,072 pounds of sodium carbonate, 4,752 pounds of ammonium chloride and three heroin presses. The 470-member NIU was established by the DEA as a specialized tactical element of Afghanistan’s narcotics police. The DEA trained 48 additional NIU members at Marine Corps Base Quantico, Va., this summer, the report said. In a recent interview, Toolan told Marine Corps Times that coalition forces under his command also have stopped smuggling with helicopter-borne raids by special operators. This Marine Corps news release highlights some of the helicopter interdiction.